The official entry lists were published on April 15th and many of the world’s finest off-road rallying exponents from the world of both car and motorcycle racing will experience the heat and rigours of the southern Qatar deserts. 35 cars, 14 motorcycles and six quads will compete in the event. Entrants will arrive in Qatar from as far afield as Venezuela, Chile, the USA, Uruguay, Bolivia, New Zealand, Australia, Colombia, Kazakhstan, Brazil and Europe and the Middle East to set the scene for a truly international rally. Qatar’s Sheikh Hamed bin Eid Al-Thani, the winner of the FIA Middle East rally series in 1993, has teamed up with regular MERC driver Edith Weiss to tackle the Sealine event. Weiss will switch to co-driving duties and the pair will take part in a Nissan Patrol T1, although they are planning to tackle more events together later in the season in a T2 Porsche Cayenne from Hock Racing in Germany. 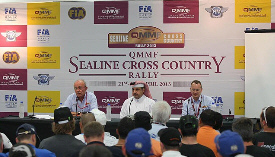 Sealine Qatar: QMMF announces revised format for Sealine Rally in Qatar 2013. "This year there will be no super special stage," confirmed Almeida. "Because of that the rally will be one day shorter than 2012 and will finish on a Friday. We will have four competitive days, four legs and four selective sections. The total length will be over 1,500km." Almeida added that each of the first three legs will run over more than 400km and the last will be approximately 300km, with the bikes running a slightly shorter route of 250km on the final day. "We are not planning to use any repeated stages," confirmed the Portuguese. "Plenty of new tracks will be used. If we compare to 2012, there will be more off-road sections and more tricky navigation."